On the 23rd of January 2014 during the 981st plenary session of the Organization for Security and Co-operation in Europe's (OSCE) Permanent Council, the Georgian delegation made a statement regarding the Russian Federation's recent extension deeper into Georgian territory of the 11-kilometre-long section of border it shares with Georgia along the Psou River because of the Sochi Winter Olympics. The Georgian representative emphasized the fact that the adoption of such a decision by the Russian Federation without Georgia's consent is a gross violation of Georgia's sovereignty and territorial integrity and contradicts Russia's international commitments-most especially basic principles of international law and the provisions of the 12 August 2008 Cease-fire Agreement. 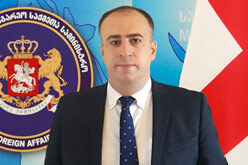 The Georgian representative continued by noting that as part of its preparations for the Sochi Winter Olympics, Russia is sparing no effort to emphasize Abkhazia's so-called "independence", and has even issued 500 passes for vehicles registered in the region in gross violation, once again, of Georgia's sovereignty and territorial integrity. The Georgian side also expressed particular concern over Russia's erection of barbed-wire fences and embankments along the administrative boundary lines of Georgia's occupied regions, as well as over its illegal build-up of military forces therein. The Georgian side then called upon the Russian Federation to comply with its international commitments and to refrain from politicizing the Olympic Games. The delegations of the United States and the European Union both made statements in which they expressed their support for Georgia as well as their concern over the extension of the border deeper into Georgian territory. The statements also reaffirmed US and EU support for Georgia's sovereignty and territorial integrity, and called upon the Russian Federation to comply with its commitments under the 12 August 2008 Cease-fire Agreement; to allow the European Union Monitoring Mission (EUMM) to carry out its mandated tasks throughout the entire territory of Georgia; and to consent to the restoration of an OSCE presence in Georgia which will be deployed on both sides of the administrative boundary line. The proceedings of the 981st plenary session of the OSCE's Permanent Council showed once again that the Russian Federation remains internationally isolated in terms of its position on Georgia's occupied territories. The Georgian delegation to the 1,189th meeting (22nd of January 2013) of the Council of Europe Committee of Ministers' Deputies also made a statement regarding the Russian Federation's recent extension deeper into Georgian territory of the 11-kilometre-long section of border it shares with Georgia along the Psou River because of the Sochi Winter Olympics.